Many great medieval bankers erected their palaces in the Oltrarno. 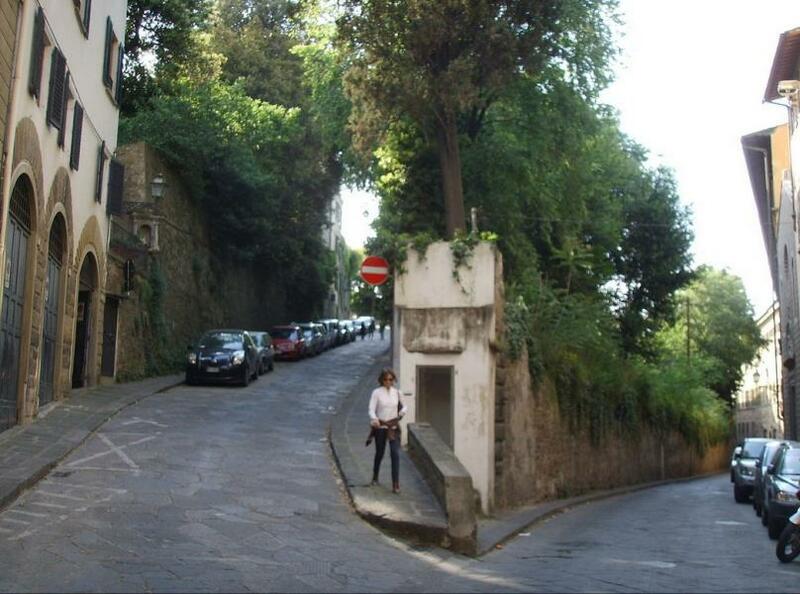 Several may still be seen along Via de’ Bardi, east of the Ponte Vecchio, a narrow medieval street once entirely owned by the Bardi. In Roman times it was part of the Via Caassia. John Pope Henessy lived in No.28 until his death in 1994. Palazzo Capponi Da Uzzano (No.23), built by the lawyer charged with executing the will of the Antipope John XXIII has a ghoulish gargoyle incorporated into its stone crest above the door. On the right, now a garden, a little plaque commemorates a stay by St Francis in 1211 at the church of Santa Lucia dei Magnoli, which has a della Robbia-like relief above the door. Another plaque marks the spot where a house collapsed in 1547, killing everyone indoors except for a young boy. Grand Duke Cosimo banned any further building on that side of the street, and took the boy in and paid for his studies, a gesture the boy repaid by becoming one of the best architects and designers of his time: his name was Bernardo Buontalenti. The end of Via de' Bardi has all recent buildings, after the Nazis demolished the medieval ones in their bridge destroying campaign at the end of the war.